SEMRUSH can be of great value if you want to make your online business successful. The makers of the workflow have developed a complete workflow for anyone who is SEO minded. SEMRUSH enables you to perform a first keyword research, check search volumes, find out your competitors’ rankings and monitor backlinks. 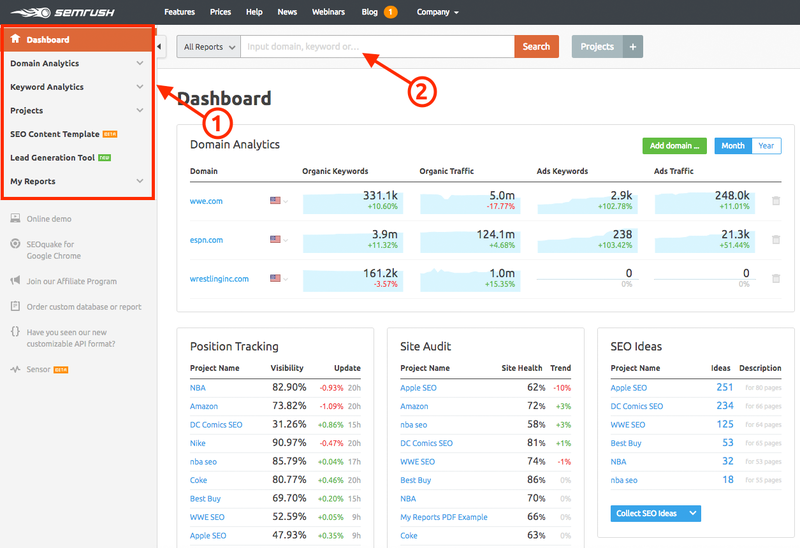 SEMRUSH makes it very easy to find out which keywords your website or page (or your competitor’s) ranks on. After completing your keyword research, you can add some extra keywords and keep track of their positions in all the important search engines on the basis of geographic locations. Especially, the geographic location functionality is valuable: bloggers and online entrepreneurs who focus on specific countries or continents, can easily find out how a certain page ranks in a specific region. It’s quite simple actually: click on the flag of the country of interest, enter a domain name and have a look at ‘Organic Research’ and then choose ‘Positions’. You’ll see a top 10 list of keywords that generate the most traffic for the concerning domain. The SEM in SEMRUSH stand for Search Engine Marketing. SEMRUSH helps you to determine the keywords that web pages use to rank with on the internet, but you also receive quantitative details. Find out which keywords you’ll rank with best and also which related keywords have potential. SEMRUSH can help you to quickly get a clear overview in the complex world of online marketing. You can easily get insight into the keywords your competition uses and what competing domains rank with. Be aware however, the data isn’t always 100% accurate but does provide a global impression of your competition. It’s very likely you’ll run into a number of interesting keywords you can implement yourself. Discover this easy all-in-one marketing toolkit! • Trend: perhaps one of the most interesting functionalities of the tool. To perform a keyword research that’s as complete as possible, it’s important to figure out the life span of a keyword. The trend option shows the search volume of a certain keyword group over the last 12 months. When you see a decrease in the number of searches during this timeframe, it means it’s not a profitable keyword group. By using SEMRUSH as a tool for SEO, you can easily find the best keywords to guide traffic to your own website. What do we think of SEMRUSH? SEMRUSH is an essential SEM (Search Engine Marketing) tool. One you actually can’t do without if you’re a serious internet marketer. As is the case with most tools, SEMRUSH works the best when you go for the PRO version. Only then you get complete reports. When you’ve just set up your own website and aren’t very familiar with SEO and SEM, you can also start with the free version. You can then discover how the tool works in a period of 14 days and then decide whether SEMRUSH is useful for you. If you’re convince, you can upgrade to a PRO account to get a fully detailed analysis of any website. SEMRUSH is available from $99.95 a month. There's also a guru, business and enterprise solution available. Get started now and get a 7-day money back guarantee!